There’s a discrepancy between the posed, polished and styled presentations we see on a lot of sewing blogs (o.k. not mine, but others) and the real daily life of sewing and wearing handmade, aptly referred to as The Sham of the Perfect. 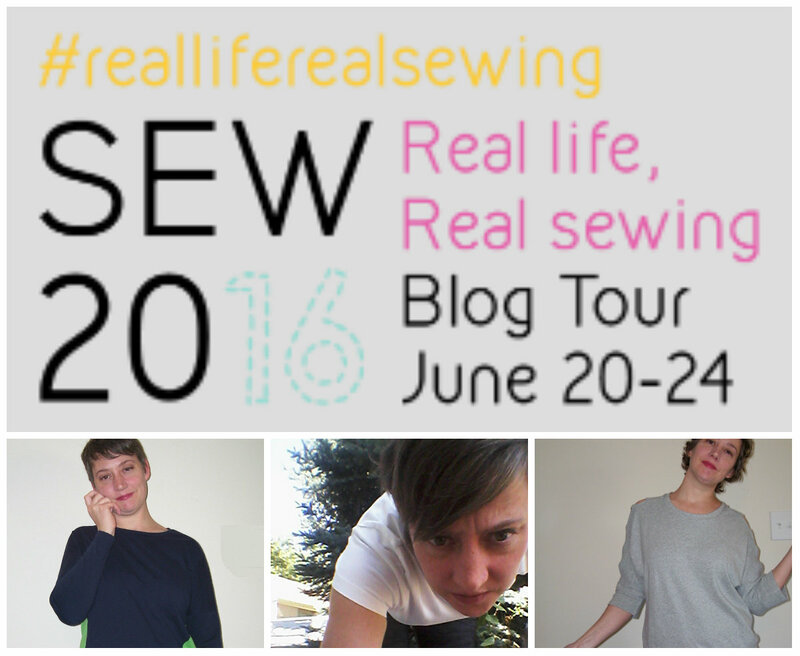 To strip away some of the false layer, today I’m going to be answering a few prompts about my process as part of the Real Life, Real Sewing blog tour hosted by Sew20. 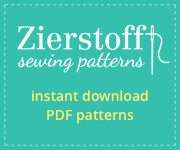 What do you look for when choosing a sewing project? I have a long list of things I want to sew and they pretty easily break down into two categories: 1. garments I want to make because I think they look cool and 2. garments I make because they serve some utility. When making my sewing plans I try to strike a balance between working from these two categories so that sewing stays fun and creative. Sometimes I have a small victory when the two happily meet. I’d like to look polished and cool wearing this funky jacket from BurdaStyle, but I reach for soft and comfortable like my Jasper Sweater from Paprika Patterns. Is there anything you would like to (or wish you could) do differently when selecting projects? I’m try to grow my blog followers by participating in a variety of sewcial activities; often when I choose to do these, my sewing list gets rearranged and projects that I am excited about get pushed back. I took some time recently to reflect on how I’m approaching my sewing and hope to strike a more satisfying balance. I’m also very guilty of making pieces without considering what I’m going to wear it with. I really need to focus on building outfits. Recent makes from my utilitarian category that jumped the sewing queue. Not terribly exciting. What is your most used/worn sewing project? 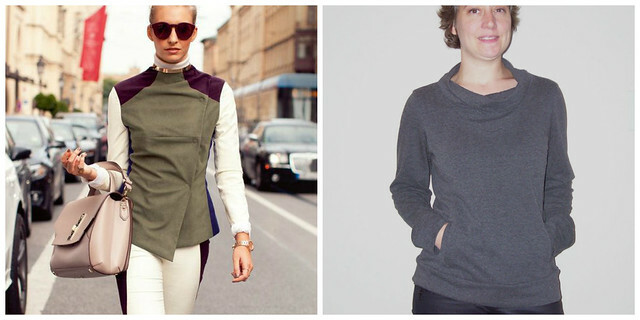 My Jasper Sweater, Ann T, and Union St tee are what I reach for most. They are easy to wear but are also indicative of my wardrobe dilemma. I want to look polished, but I reach for comfy. Do you have a project that you thought would be used/worn frequently but just did not end up working out? When I created my reversible Pin Peg Mini skirt I thought I had nailed it with creating a piece that could work all year round and had that edgy look that I like, but I’ve only worn it once. The skirt is meant to be body skimming but the two layers of fabric feel thick and it’s a little loose at the waist. My plan is to take it apart, take it in, and separate it out into two better fitting skirts. What is your favorite tip or quote that applies to sewing for real life? Take your time and do it right! – I cringe at a lot of my early sewing projects because I took shortcuts to save on fabric or time and the results are sooo evident. Poor fit and poorly constructed are written all over them. These were not rookie mistakes, they were just bad decisions. Taking the extra time, using the right notions, and making test muslins have improved my sewing results more than I can measure. Do you have any examples of Real Life, Real Sewing to show off? You can play along by using the #realliferealsewing on social media. You can also win one of two $25 gift cards. More details at Sew 20. I can definitely relate about needing to focus more pieces that can be part of a wardrobe. I’ve managed to reign it in this year when sewing for the kids but what little sewing I do for myself tends to be random. I’m guilty of wanting to look sharply styled but always reaching for the comfy too. Jasper is probably my favourite garment right now. Good luck sorting out the fabrics on that skirt – they look worth making the effort for. I had to learn the hard way that one MUST TAKE time to do things neatly. haha, When I first started sewing I rushed thru my projects because I wanted to see the finish so bad. BIG MISTAKE! lol – Now I totally obsess about clean finishes and doing all the steps properly. Great read! Really lovely hear a different view of sewing, I always find myself reaching for the comfy and practical items I’ve made which is frustrating as they’re the things that didn’t take as long to make compared to a shirt dress I’ve slaved over. Thank you for the thoughtful and encouraging response. I’m glad to hear I’m not out in the wind here. Now I really want to get that skirt fixed. I loved both those fabrics and the style. Always nice to hear from the lady behind the lovely sewing! Melissa you have grown in your sewing and that is something to be proud of. Thank you. I have improved and feel much better about the quality of what I’m making.